All Web addresses mentioned were functional as of 6-24-16. From the Cumberland Gap to the Atlantic Ocean, this is Virginia Water Radio for the week of June 27, 2016. The sound of a rattlesnake opens our introduction to a Virginia state natural resources agency that turned 100 in June 2016. Have a listen for about 30 seconds to the following mystery sounds—all related to that agency’s missions—and see if you can guess the agency. And here’s a hint: you’ll win this game by fishing for the answer. If you guessed the Virginia Department of Game and Inland Fisheries, you’re right! Reptiles, frogs, boats, fishing, birds, elk, and much more fall within the scope of this department, tasked with managing wildlife, fish, and habitats across Virginia’s lands and inland waters. The department began on June 17, 1916, with its first office in the Senate cloak room of Virginia’s Capitol building, and with its first priority to appoint game wardens who could reduce wildlife poaching. From that modest beginning, the department has grown into today’s central office in Richmond; regional and district offices in several locations; and nine fish hatcheries across the Commonwealth. The Board of Game and Inland Fisheries, made up of 11 citizen members appointed by the governor, oversees the work of the department. 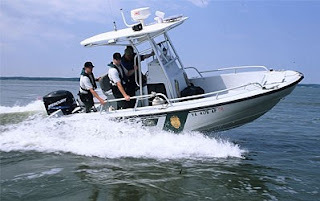 According to the department’s mission statement, that work includes the following five major areas: managing populations of wildlife and inland fish; providing opportunities for citizens to enjoy wildlife, fishing, boating, and related outdoor recreation; protecting the rights of citizens to hunt, fish, and harvest game as provided for in the Virginia Constitution; promoting safety in boating, hunting, and fishing; and providing educational programs about Virginia’s fish and wildlife. From boats to game-check stations, catfish to frogs calls, fur-bearers to freshwater mussels to fishing-line recycling—the world of the Virginia Department of Game and Inland Fisheries now occupies a very large "cloak room" indeed. The rattlesnake and elk sounds were taken from the U.S. Fish and Wildlife National Digital Library, http://digitalmedia.fws.gov/cdm/. The rattlesnake sound was accessed at http://digitalmedia.fws.gov/cdm/singleitem/collection/audio/id/61/rec/18; the elk sound was accessed at http://digitalmedia.fws.gov/cdm/singleitem/collection/audio/id/22/rec/6. All other sounds were recorded by Virginia Water Radio. The Virginia Department of Game and Inland Fisheries (VDGIF) produces the Virginia Wildlife Action Plan, a 10-year strategic plan that identifies species and habitats needed particular conservation attention. VDGIF information about the plan, which was most recently updated in 2015, is available online at http://bewildvirginia.org/wildlifeplan/. Virginia Water Radio Episode154, 3/25/13, focuses on the Wildlife Action Plan and includes music recorded especially for the Plan in 2007 by Virginia musician Adrienne Young-Ramsey and her group Little Sadie. 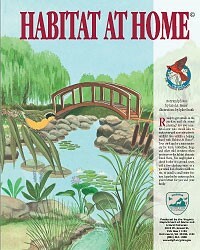 lower – educating property-owners on providing wildlife habitat (image of the cover of VDGIF’s “Habitat at Home” booklet, accessed at http://www.dgif.virginia.gov/habitat/). Bill Cochran, “Virginia wildlife agency turns 100,” by Bill Cochran in The Roanoke Times, 6/12/16, online at http://www.roanoke.com/sports/outdoors/bill-cochran-wildlife-agency-celebrates-years-of-success/article_30599d02-d671-5cea-9b29-e763592c22dd.html. 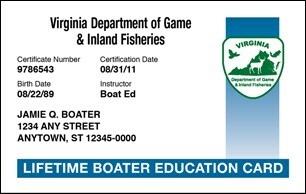 Virginia Department of Game and Inland Fisheries (VDGIF), main Web site http://www.dgif.virginia.gov. See the “About VDGIF” link for the department’s mission statement. VDGIF, “Elk Management and Restoration,” online at http://www.dgif.virginia.gov/wildlife/elk/management-plan/. VDGIF, “Fishing Line Recycling Sites,” online at http://www.dgif.virginia.gov/fishing/fishing-line-recycling/. VDGIF, “Freshwater Mussels,” online at http://www.dgif.virginia.gov/wildlife/freshwater-mussels.asp. VDGIF, “Game Check Stations,” online at http://www.dgif.virginia.gov/hunting/checkstations/. VDGIF, “On the Road to the 100th,” online at http://www.dgif.virginia.gov/100/. The department’s first annual report (September 1917), available online (as PDF) at http://www.dgif.virginia.gov/100/vdgif-first-annual-report-1917.pdf, describes the department’s first office and first tasks. VDGIF, “Virginia Birding and Wildlife Trail,” online at http://www.dgif.virginia.gov/vbwt/. VDGIF, “Virginia Frog & Toad Calling Survey,” online at http://www.dgif.virginia.gov/wildlife/frogsurvey/. VDGIF, “Virginia Wildlife Action Plan,” online at http://www.bewildvirginia.org/. VDGIF, Virginia Wildlife magazine, online at http://www.dgif.virginia.gov/virginia-wildlife/. The May/June 2016 issue is a special 100th anniversary edition. You can contact the department’s main office at P.O. Box 90778, Henrico, VA 23228-0778; phone (804) 367-1000. The regional offices, district offices, and fish hatcheries are all listed at this Web site: http://www.dgif.virginia.gov/about/offices/. VDGIF videos on many topics are available online at https://www.youtube.com/user/VDGIF/videos. The “Fish Head Chronicles,” by Jason Hallacher, in VDGIF’s Region 4 office, cover a variety of aquatic life and fishery topics, such as sampling for Snakeheads at Mt. Vernon, invasive Water Chestnut removal, stream restoration on the Maury River, and population estimates of Smallmouth Bass in the New River. The videos are available online at https://www.youtube.com/channel/UCWwKl6ZCwUDtnmOCNxoAVsA. For fisheries or boating episodes, see also the “Fish” and “Recreation” categories. Many of the episodes in the “Amphibians” category use frog calls from a CD sponsored by the Virginia Department of Game and Inland Fisheries. For previous episodes on other agencies or organizations involved with water in Virginia, please see the “Community/Organizations” subject category. Virginia Wildlife Action Plan - EP154 – 3/25/13.